The Windham boys varsity basketball (6-9) hosted the South Portland Red Riots (9-6) Tuesday night. A lot of Windham fans came to watch as South Portland’s new coach Kevin Millington faced off against his old team the Windham Eagles. Both teams played strong throughout the first half of the game and you could clearly see each team had the desire to win the game. First quarter ended with Windham ahead 17-15, second quarter showed the score 29-33 with South Portland taking the lead. The biggest gap in the game came in the third quarter with the Red Riots taking on a 10-point lead ending the quarter 45-55. Though the fourth quarter went to the Eagles, it wasn’t enough to pull ahead with the game ending South Portland 70 – Windham 63. Nicholas Curtis led Windham with 27 points, including four 3-pointers, and was 11 of 13 at the foul line. Mike Gilman added 15 points along with Kyle Kilfoil and Hunter Coffin adding 6 points each, rounding up the score board were Chris Brown with 5, Josh Lacombe and Austin McGowan adding 2 each. “Last night we could not catch a break. We did a great job of handling their interior size and athleticism throughout the game. The difference of the game was their bench contribution from players that had not gotten a lot of opportunities prior to our game. Those players made shots from the perimeter that we had scouted as the shots we wanted them to take. To their credit they made them when they counted. We had to pick our poison with South Portland and we had to live with the result that they made some outside shots,” said coach Chad Pulkkinen. “Our guys did a great job fighting for a win, that I feel they deserved. South Portland’s size on paper would make one believe we would be destroyed on the glass and our ability to matching them 29 to 29 on the boards was a great victory for our guys and allowed us to really control the game. Some nights certain things happen that you do not expect, last night South Portland’s role players came up huge and helped them steal a win,” Pulkkinen added. The remainder of the season for Windham is crucial. The team is fighting for a playoff spot which Bangor has now made very difficult with their big wins against single A Brewer and AA Oxford Hills over the last week time frame. The Eagles face a tough, improving Bonny Eagle team Friday, number one Thornton Academy Tuesday at Thornton and number two Gorham at home Thursday. "We have a tough road but as our guys have proved all year we can play with anyone and we will be ready for the challenge at hand,” Pulkkinen added. On Saturday, February 6th, the Windham High School varsity cheering squad will compete in the first state competition since 2004. “This is the most inspiring, small team that’s heading into the state competition. 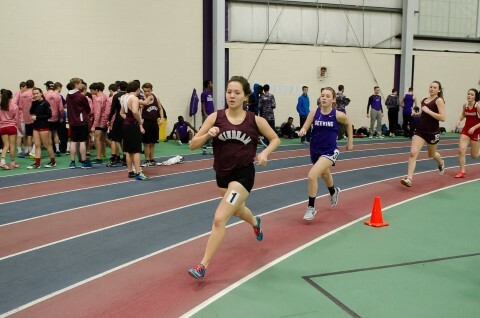 Five of the girls have never competed at a varsity cheering competition,” said coach Jamie Gaudreau. 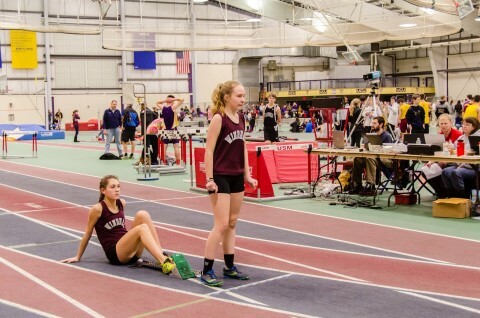 The 13 girls and one alternate going to states is the smallest team that Windham has had. Last weekend the team finished fourth earning them a spot at the state meet. “Their love and passion for the sport shines through in Windham and in competition. Fourth place was, even though we compete against ourselves, already like winning a championship,” Gaudreau said. Two of the girls on the team were able to master their standing back handspring for the last competition, which boosted their tumbling difficulty score, helping them to pass other squads. Judging at the competitions is based on motions, dance, stunts, jump and voice to name a few. This year the team has new uniforms, which makes a huge difference in the tumbling and flexing, according to Gaudreau. The one piece outfit is comfortable and not as still, she added. Gaudreau has been coaching the Windham team for four years, so the five seniors she has on the team she has worked with for four years. This year, the assistant coach is Karleigh Gaudreau, the coach’s daughter and the team chorographer. “It’s a lot of pressure to create material for the girls to compete with,” said coach Gaudreau. “They love to perform and their expressions and energy show throughout the entire performance,” she added. Coaches from other schools and some who didn’t make it to states complemented the team on how improved the Windham team was and how happy they were for Windham. 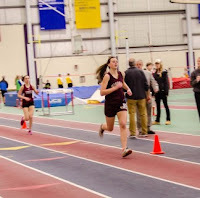 The high school athletic boosters is paying for the team to spend the night in Bangor before the competition so the girls will be ready on Saturday morning. 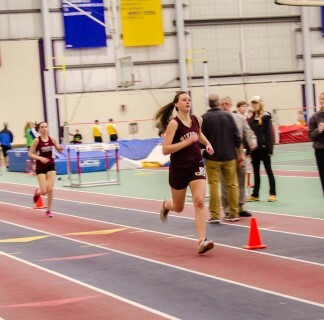 After graduating many strong, talented seniors last year, the Windham girls track team is working hard to make a mark in individual events. They have also had many injuries and illnesses. With one meet remaining in the regular season, their record is 1-12. However, girls are continuing to qualify for the state championship meet. The following is a listing of who has qualified. Some have an automatic bid at states, while others are provisionally qualified and their attendance is dependent upon number of qualifiers at the automatic mark, so they are not a sure in as of yet. Junior swimmer Olivia Verrill is the Aroma Joe’s athlete of the week for her first qualifying time in the 100 yard butterfly in swimming. The Windham High School swimmer also plays field hockey. “Olivia made her first qualifying time this week in the 100 fly. She has worked very hard and consistently showed leadership and good sportsmanship. She is a class act,” said coach Kyle Rasmussen. Her sports hero is Natalie Coughlin. “She’s inspiring because she is an example of how hard work and dedication can help you overcome any obstacle to reach success,” Olivia said. Not balancing sports and school is not an option. “After a full day of school and a two to three hour practice there is no time for procrastination. You have a strict schedule and you have to get things done,” she said. Olivia also likes swimming, kayaking, ice skating and wing night with her friends. She plans to attend college and medical school to specialize in trauma. Olivia is the daughter of Leslie and David Verrill. She also has a brother Austin, a dog Millie and a cat named Cadbury. On Monday, January 18, 2016, a dream was achieved. Sadie Nelson a senior at Windham High School scored her 1,000 point in her high school career for girls’ varsity basketball. 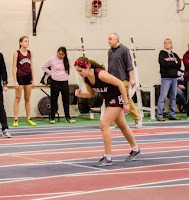 Sadie is such a well-respected teenager, student, daughter, friend and person within the Windham community that individuals from the ages of kindergarten to grandparents packed the gym to watch and support her career record moment. The girls’ varsity team (7-6) hosted the Auburn Eddies (11-2) where the Lady Eagles handed Auburn their second loss 47-42. 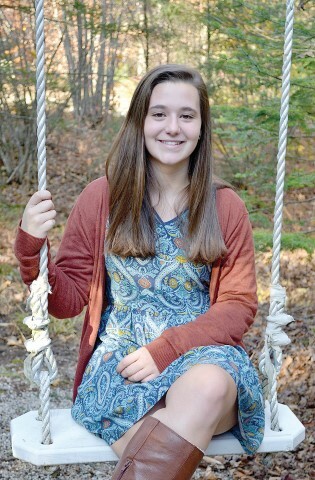 Sadie started playing basketball in third grade; her first team was through the Windham Youth Basketball Program and sponsored by Chutes Family Restaurant, a local breakfast spot. Realizing her passion for the sport of basketball while in the fifth grade, Sadie started taking it more seriously. Deciding she wanted to better herself and become a skilled ball handler while honing her defensive skill she started to join some of the Maine Elite teams that were offered for young players like herself. Having so many memorable moments throughout her high school career of playing basketball, listing a few of those that were standouts is a challenge. One of the top moments was her sophomore year when Windham beat Thornton Academy at the buzzer and then followed it up by defeating Cheverus, which brought the Lady Eagles to the Western Maine finals. Another memorable moment and most recent was scoring her 1,000 point along with getting a huge win over Edward Little both in the same day. Sadie’s inspirations have always been her parents, Wayne and Kimberly Nelson. “I have always wanted to prove to them that I can be great and that I can push myself to be great at anything I do. I couldn't have done it without them and I owe them everything for putting so much of their time into my athletic career,” Sadie said. Another inspiration for Sadie is the little kids in the community. Doing whatever she can do to be involved in some part of their lives. Sadie appreciates how they have cheered her on during her games, some even traveling to watch her and the Lady Eagles play away from home. Speaking with them at their practices from the Windham Youth Program up to the middle school teams is another passion for Sadie. “Anything to see them smile when they see me, it means the world,” she said. “Sadie has had a work ethic unlike any other basketball player in Windham over the past four years. More often than not, she would come in the gym at 6 a.m. and get 200 plus shots up before school started. She has traveled all over the east coast playing with her AAU program, competing against some of the best competition in high school girls’ basketball. She has received numerous honors from her playing days here at WHS, including First Team All-Conference player for the SMAA. She has always been in the conversation with the best high school girls’ basketball players in our conference since she was a freshman,” said Coach Artes. “With all of the aforementioned anecdotes about her work ethic and her abilities on the court, Sadie’s most significant contribution to the Windham girls basketball program is her love and desire to work with the youth, a trait that will keep on giving for years to come. Sadie has been a great role model for young athletes throughout her four years at Windham High School. The future of the program looks up to her as a leader, as a captain, and as a stellar basketball player. She always makes time to go out of the way talk to the younger kids, giving high fives or words of encouragement, and as I mentioned before, that aspect of the person that she is will continue to be immersed in the Windham Youth Basketball program even after Sadie graduates in June,” Artes continued.